but that one had been cropped (not by me) and so it did not have the date on it. Now that I have a decent copy (undamaged and complete) of the photo, and know the reason it was taken, I felt it justified a new entry here on Flickr. The reason for its being taken was the last day of Mr Meldrum as Chief Constable of the force. On Wednesday 11th May 1949, once this photo parade had dispersed, he would thereafter clear his desk in the Burgh Police Station at Castle Wynd in Inverness, and prepare to remove to Forfar, to take on the post of Chief Constable of the Angus Constabulary on Monday 16th May. To Mr Meldrum’s right is Inspector (and Deputy Chief Constable) William Paterson, who would take charge of the Burgh force until he was appointed its next Chief constable the following March. This photograph is remarkable for two reasons. One wonders if this photograph would still have been taken here if that sign was then in place, and if so what efforts would have been taken to prevent its appearance in the photo? On parade in this photograph are precisely 40 officers – the entire force. So who was covering the Burgh? Presumably an amicable arrangement was in place between Mr Meldrum and Chief Constable William Fraser of the County Police. While there was rivalry between the two forces (which continued on in a jocular fashion after merger in 1968 and beyond), there was also a great relationship and mutual respect. There was also the closest of relationship geographically, as the Burgh HQ is just out of shot to the right, down the Castle Hill opposite Inverness Town Hall. Some fifty yards as the crow flies, and less than 100 yards on foot down the Castle Brae. To my knowledge four officers in the photograph are still with us, all well into their 80s (or higher) now. Finally, it worth mentioning that in the back row is PC David Lumsden, who retired in 1949 . He served 12 years in the Army, and thereafter 3 and a half years in the Ross & Cromarty Constabulary before transferring to Inverness Burgh. He passed away in 1963. 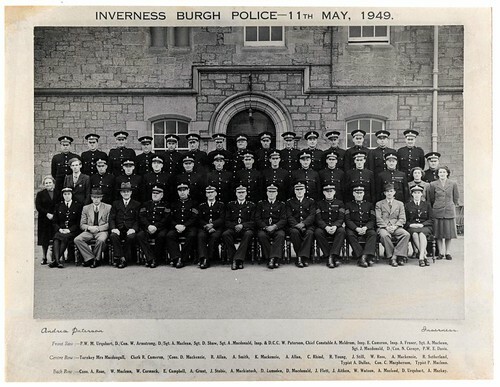 In 1951 his son Evan joined the Burgh Police and was subsequently promoted to Detective Sergeant. He was a keen member of the Force’s Sub Aqua Team, which was frequently deployed around the Highlands. Tragically on 3rd November 1968, while searching the Caledonian Canal at Corpach, near Fort William for a missing person, Evan and colleague PC Ian Ritchie were both drowned after they were trapped underwater in a canal lock.